The Skilled 504 is an electro mechanical robot with articulated cinematic structure type SCARA with 4 interpolated axes, and a working area of 360°. 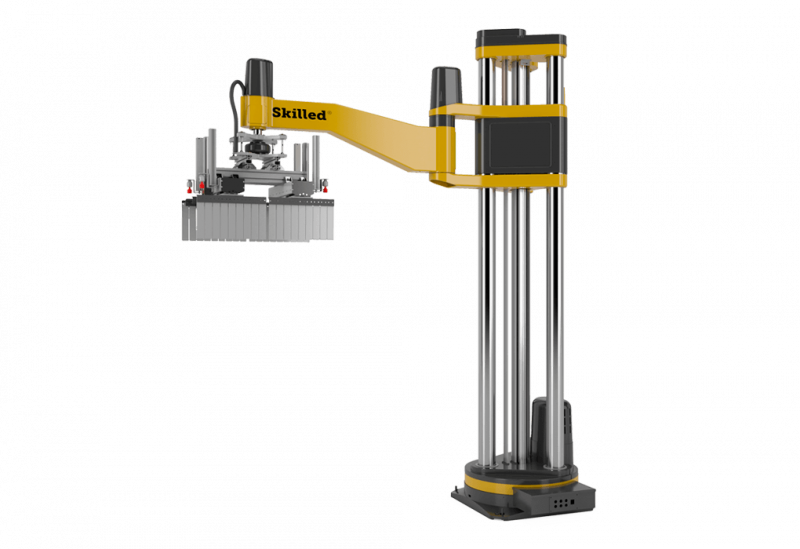 Our first SCARA robot (Selectively Compliant Assembly Robot Arm) was launched in the market in 1996 and since then it has been installed in over 1000 plants worldwide. Thanks to its high flexibility and possibility to customize the pick-up tool for illimitated range of applications (cardboard boxes, bundles, heat-shrunk trays, bags, cans, reels, etc. ), the Skilled 504 has been used to solve a wide variety of end-of-the-line product handling problems in the most diverse plant logistic situations. Its friendly and powerful programming method has been developed in Visual Basic completely by our engineers on the basis of 30 years experience in the palletizing field, in order to quickly carry out any kind of personalization at any time. Ideal for palletising multiple lines.